MixWizard WZ4 12:2 OVERVIEW WZ4 12:2 is your ideal companion for those scenarios where you don't need masses of channels, but you still need to deliver superb audio quality. The 2 dual stereo channels are perfect for stereo playback or for hooking up keyboards and other stereo instruments. WZ4 12:2 features our acclaimed 4 band EQ with 2 sweepable mids, high quality 100mm faders, 6 aux sends, 12 segment bargraph metering and our unique QCC connector system for easy desktop, rack or flightcase mounting. 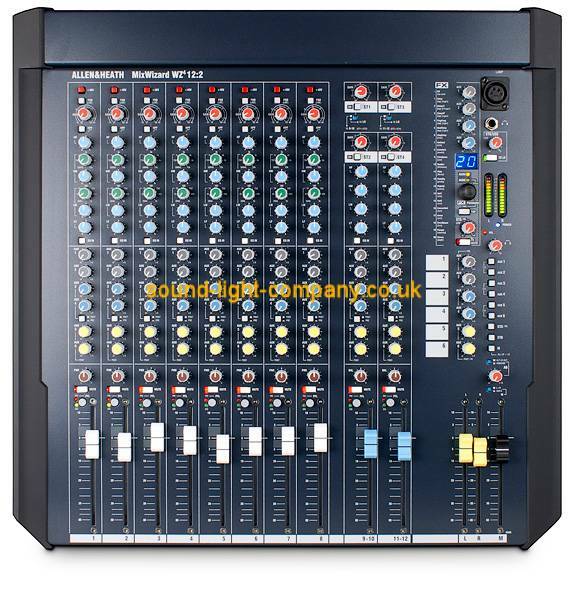 New features for this 4th generation MixWizard console include two newly designed digital FX engines with 20 studio quality FX presets, EQ in/out switching and the option to fit a multichannel USB interface with high quality 16 channel soundcard for easy multitrack recording and 2-track playback. If you're looking for professional grade, all-purpose analogue mixers in a compact, rack mountable frame, the MixWizards continue to set the bar.